I've had my eye on this bread for quite some time now, and I finally got the chance to make it last night. I'm so glad I did, because it was absolutely delicious! The artichoke topping is incredibly creamy and flavorful and pairs so perfectly with the crispy bread. It reminded me a lot of hot artichoke dip. I followed Megan's suggestion and sprinkled some chopped parsley on the top, and I loved the freshness it added. I don't really know what else to say about this bread; it was simply amazing and will definitely be repeated in our house! 1. Melt the butter in a skillet over medium-high heat. Add the garlic and cook until fragrant, about 30 seconds. Add the artichoke hearts, cheeses, sour cream, and salt and pepper. Stir to blend. Remove from the heat and cool. 2. Slice the bread lengthwise. Spoon the artichoke mixture evenly onto the bread. Broil until cheese has melted and bread is hot. Top with chopped parsley and cut into slices. 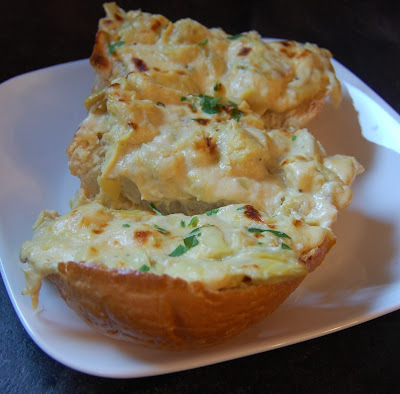 Oh wow, this looks amazing - like super kicked up garlic bread, yum!